Since we're still struggling with server troubles, I'm going down memory lane here and posting a couple of paintings out of my murky past. The first painting dates from about 1980. You can probably see the influence of my early idol, Andrew Wyeth, in this work. A bit of backstory on why I called it "Trespasser:" I wandered uninvited one winter day into this old abandoned farmhouse. The main room was empty except for this fabulous bathtub. It was so bizzare and I knew immediately I wanted to paint it, so I sat on the floor and began a drawing. In about ten minutes I heard a truck come up the driveway. In stormed the owner, a local farmer, furious that I was there. I was apologizing, talking fast, showing him my drawing and trying to convince him I was a harmless eccentric. He walked to the window and silently stared out, hawklike, for several long seconds, thumping his finger on the windowframe. Then I could see his face visibly soften. He said he guessed I wasn't doing any harm and I could go ahead and finish what I started. He left and I sat in the silence, drawing. 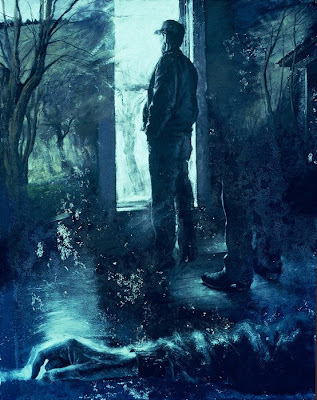 I couldn't get that image of him at the window out of my head-- he just had to be in this painting. After about a week I screwed up enough courage to ask him to pose, and to my surprise he said yes. When he came in the door he chuckled and said "Where do you want me, in the bathtub?" This second piece was done about four years later. By then I was experimenting a lot with less literal approaches to subjects. When I revisited the Trespasser theme the result was a less controlled, more dreamlike image. Wonderful painting - and the story is great. This piece has a feel of a Wyeth. Whoa, terrific paintings! I especially love that second one! Beautiful paintings,! It's a good thing he didn't show up with a shotgun! LOL! Don these are fabulous as are the stories. Capturing a moment and exploring different interpretations with your medium - now that's art! Great story and beautiful painting. 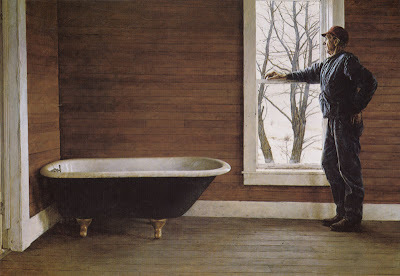 I thought of Andrew Wyeth the minute I saw it. It is really a stunning piece, one that would appeal to a great audience! Simply beautiful. Great composition. Love the figure, and the feeling! Hi Takeyce--yeah, I'm really glad he wasn't "packing." Thanks. Triecia--really kind of you to say--thank you. Hi Alvin, thanks for visiting and for the nice comments. Thanks so much, Joan--good to hear from you. These are fantastic. I'm glad you had the nerve to make yourself at home. Did you ever make reproductions of either? Hi Dar, thanks a lot. No, I didn't make reproductions. The paintings have long ago been sold. These photos of them are pretty poor but all I have. Terrific story Don and very strong painting. I can see the Wyeth influence but its uniquely you . Thanks so much, Diane. I'm happy to have discovered your work as well. Thank you for your thoughts, Dixie.